You’ve thought of everything in preparation for trick or treating. You’ve trained your young Jedi in the ways of the Force. You’ve taught them all of your lightsaber skills. You’ve even decked them out in an awesome costume from their favorite Star Wars movie. There’s still one thing that you’re missing to make your child’s night a complete success… the perfect bag! Yes, there are some things that all of the training in the world won’t help with. Carrying that motherlode of candy that your child will haul in, is one of those things. You need this Star Wars: A New Hope inspired shopper tote. 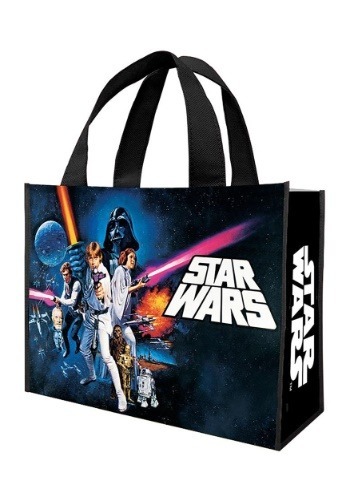 This officially licensed tote bag has the original Star Wars movie poster image on the exterior. It has plenty of space inside for all of the treats that your child is going to bring in on trick or treat night. It also doubles as a great bag that you can take with you to the grocery store to cut down on the amount of bags you use! Whether your child needs a great trick or treating bag, or you just want a new shopping bag to keep in your car, this Star Wars-themed bag will do the trick!